As the year draws to a close, I find myself musing about what I learned — or didn't for that matter. One item that continues to go unanswered is why do sliders taste so good? I've had a wide variety of sliders, which seemed to be one of the darlings of the gastropub fare this year, and I found them all delightful. Am I enamored with their diminutive size, the food equivalent of dollhouse furniture? Is it the easy to manage physical footprint? Is it the comfort food quality it usually possesses? Whatever the reason, I find myself drawn to them when I see them on a menu, and 9 out of 10 times I'll order them, regardless of time of day. Which got me thinking about a breakfast slider. I made some last year after a holiday party I hosted. It was more of an act of desperation than an earnest culinary creation as I'd been over-served the night before and in dire need of some food. The leftover rolls and honey-baked ham were the base inspiration, which were joined by some cheese, roasted red pepper and a drizzle of basil-infused olive oil. It was a fantastic substitute for a greasy cheeseburger and fries, which is my normal Rx after a night of over-indulgence. I woke up famished this morning (no, I was not hungover) and found myself rooting through my refrigerator to see what I might be able to call breakfast. Low and behold, I had a few mini rolls, eggs and bacon — and my breakfast slider took shape. This time I used goat cheese and some spicy marinara sauce I'd made a few days before. It was a delicious start to the last day of the year. So if you're a slider fan like me, give it a try some time. The combination of ingredients is almost endless and I'm pretty sure it's impossible to mess up. You may thank me tomorrow. Wishing you a safe and happy New Year's Eve! They say you're a product of your environment. But what if you have two environments? Over the years, I've come to feel as if I have a split personality. Have you ever taken one of those tests that measures what part of the brain you tend to use more? Usually it's measuring right-brain versus left-brain or the analytical versus the creative sides. While most people lean definitely to one side or the other, I'm pretty much right down the middle, showing that I can be both. Although I'm left-handed, I wanted to copy whatever my right-handed brother did, so I ended up kind of ambidextrous. When I'm in California, I tend to crave tofu in green curry sauce and recycle, but as soon as I set foot back in the South, my accent kicks in, I wave to every person I drive by, and go in search of Krystal burgers and biscuits. But now that I'm back in my Santa Barbara environment, I'll be happily heading down to the nearest liquor store to pick up a tasty carne asada taco (for some reason, that is where the best Mexican food is made fresh to order and sold), and then fill my car up with gas that is $1.50 more expensive per gallon. Sunday is the day of the week I miss my family the most. I long to be cooking and eating a home-made meal together, leisurely sitting around the table telling stories and talking about how my brother will never be able to work his way back into the family will. [OK that last part is true but a long-standing joke.] It seems like a fitting way to recenter myself before getting back to the grindstone on Monday. Unfortunately, since my family is 3000 miles away, our Sunday suppers don't happen very often. As a very poor substitute, I find myself turning to more Southern dishes to make on Sundays. It's not the same of course but I do feel closer to home. Yesterday I had a hankering for collard greens and concocted a "beans and greens" soup, finished off with some rosemary studded cornbread. I guess the former dish is kind of my version of chicken soup for the soul. I don't know if it's for everyone. Maybe collard greens are something you have to grow up with to appreciate fully. I have a feeling not many people routinely eat collard greens in Santa Barbara, as I had to go to three different grocery stores before I could find them. The corn bread would never get my grandmother's approval. For one, it's too sweet for her. She calls this yellow cake mix and scoffs at the attempted association with proper corn bread. And the addition of the rosemary may send her over the edge. But if you love cornbread and yellow cake mix (like me), then this is heavenly. The challenge is not to eat half the pan before dinner (like me). I had the best intentions of taking a photo of it but must confess there is none left to photograph. Cut sausage into 1/4-inch thick slices; saute in a Dutch oven over medium-high heat 5 minutes or until brown. Add onion and saute 3 minutes. Stir in beans and remaining ingredients through pepper; bring to a boil. Reduce heat, cover and simmer, stirring occassionally, 20 minutes or until greens are tender. Before serving stir in vinegar and honey. Yields: 6-8 servings. Note: You could definitely substitute frozen turnip greens with diced turnips for the collard greens. Also, almost any kind of sausage and bean could be used. I used white beans and kielbasa but I think black-eyed pea and andouille, for example, would be delicious. Heat oven to 400 degrees. Lightly coat a 13x9 inch baking pan with cooking spray and set aside. Stir all the ingredients together in a large bowl and spoon batter into the prepared pan. Bake 25 minutes or just until golden. Remove to a wire rack to cool. When I was young, a salad carried a pretty narrow description. You had a few sad, pale leaves of iceberg lettuce along with a smattering of diced onions, sliced carrots and maybe a wedge of tomato. And there were three dressing options: French, Italian and Thousand Island. It's no wonder I couldn't get excited about eating that each night (no offense, Mom!). But thankfully at some point, the salad evolved. Like the high school wallflower who shows up at the reunion a complete stunner. The salad is stealing the show these days, giving the main course a run for its money and redefining the notion of what a salad is. Wolfgang Puck gets credit for reintroducing us to pizza back in the 80s when he opened Spago. It became white tablecloth-worthy when he began topping his pies with gourmet and exotic ingredients. I don't know who deserves the distinction of transforming salads but there is no denying the metamorphosis. You've now got a myriad of greens as the base (watercress, endive, mache . . . ), a dizzying list of cheeses to choose from (cambazola, halloumi, manchego . . .), and truly endless options of accoutrements (seared ahi, pistachios, roasted beets . . . ). It's the ultimate chinese menu of alternatives. This salad rendition is great for the holidays because the pomegranate seeds make it swanky, the roasted butternut squash makes it hearty, and the fried prosciutto makes it a little indulgent. And it's rather show-stopping sitting on the table. Quite the anti-wallflower as salads come. Preheat oven to 450 degrees. Toss squash, olive oil, and crushed red pepper on large rimmed baking sheet. Sprinkle with coarse salt. Roast 15 minutes. Using a spatula, turn squash over. Roast another 15 minutes or until edges are browned and squash is tender. Sprinkle with coarse salt. This can be made 2 hours ahead. Let stand at room temperature. Lay the prosciutto slices on top of each other and slice them thinly in a chiffonade. In a hot skillet, add a bit of olive oil until almost smoking. Add sliced prosciutto and saute for 30 seconds or until it starts to crisp. Remove and set on a paper towel. Whisk orange juice, walnut oil, and lemon juice in large shallow bowl. Season to taste with salt and pepper. Add arugula, toasted hazelnuts, prosciutto, and pomegranate seeds; toss to coat. Season to taste with coarse salt and pepper. Spoon warm or room temperature squash over salad. Drizzle with pomegranate molasses and serve. Yields: 6 servings. Note: Pomegranate molasses is a thick, tart syrup found at some supermarkets and Middle Eastern markets. You can omit it if you can't find it. It finishes the salad with a nice zing. If you're feeling really motivated, you could try to create your own by reducing down pomegranate juice or you can soak pitted dates overnight in pomegranate juice and then puree. To many people, Thanksgiving is all about the turkey. And who could blame them for getting excited about 20 pounds of succulent meat perfectly roasted and nicely carved on a platter? But then there are those — you know who you are — who could forego turkey all together and consume happily only the ridiculous amounts of side dishes: stuffing, green beans, sweet potatoes, cranberry sauce, etc. I personally would be hard pressed to join any one camp, but I definitely have my opinion about what is required to complete my Thanksgiving meal. I like white meat better than dark, prefer dressing over stuffing, could pass up the sweet potatoes for the mashed, and can skip the cranberry all together. My dad wants all dark meat, rice not potatoes of any kind, and anything with onions in it. My mom on the other hand really just wants a turkey sandwich with all the fixings. As you're reading this perhaps you're making a mental inventory of which foods make it on your "necessity list." Above all, though, Thanksgiving is one of those holidays with lots of traditions behind the meal. In fact, many times dishes are named after the "chefs" who've made and contributed them year after year to the celebratory feast. We've got Monk's cranberry salad, Carla's banana cream pie, Patty's broccoli casserole . . . . I shutter to think what would happen if that person decided to bring something else one year. But every once in a while, someone throws a new wrench into the mix that is met with wild applause and is then destined to become yet another tradition. We had one of those this year. 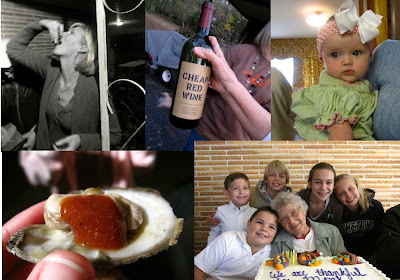 Thanksgiving happened to coincide with my grandmother's 90th birthday. As you can imagine, we had quite a crew in town for the family meal and to honor this remarkable woman. After the second helpings, touch football game, family portraits, and fawning over the new babies, a collective sigh of contentment could be heard as the sun started to set. About that time, my brother's father-in-law, Jimmy, walked over to his truck, put the gate down, and pulled out a large cooler filled to the brim with Apalachicola oysters. Apalachicola oysters are some of the finest — if not the finest — oysters in the world. And I can never find them in any California restaurant or outside of the Southeast for that matter. Meaty, mellow, plump, clean-tasting. Heaven on the half shell (no accoutrements needed). 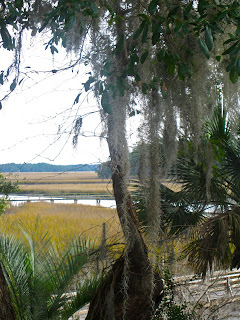 The uniqueness of Apalachicola oysters comes from the right mixture of water from the rivers that flow from Georgia and Alabama and the salty water from the Gulf of Mexico. 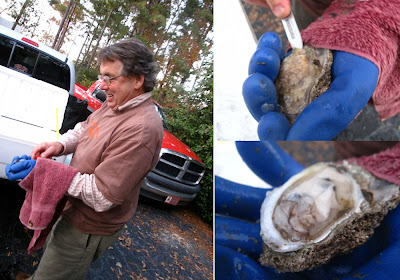 Jimmy and my brother pulled on a rubber glove, grabbed an oyster knife and started shucking. Believe you me when I tell you they couldn't shuck fast enough. After the heavy, rich Thanksgiving meal, this cold, refreshing, buttery-seaweedy treat was the perfect palate foil. As much as I love the softness and slight saltiness of oysters, I'm very drawn to the Zen-like ritual of preparing and eating them: the shucking, the anointing of sauces, the tilting of the shell, the slurping of the liquor, the tossing of the empty shell into a pile. And eating oysters is very adult. I don't know how else to say it. I think most people remember the first time they sucked down a raw oyster. Usually it is in the company of adults. You're presented with a seemingly slimy blob. You want their acceptance but you're not sure which is worse: "failing" them or eating this creature. Their approval wins out and you close your eyes and throw back the oyster. Afterwards you feel a mixture of relief and pride — and then ask for another one as the adults are high-fiving you. 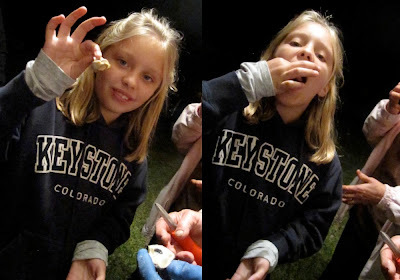 My niece had her first oyster conversion experience this Thanksgiving. And I was proud of her. While the raw oysters were outstanding, Jimmy showed us a new way to grill them that literally had people lined up for them. You take a cooking pan and pour a layer of rock salt on the bottom creating a bed to place the oysters on. You then cover them up with a wet dish towel and let them steam for a few minutes (until the shells start to open). The end result is to die for. It's so easy and so ridiculously tasty. Please try it the next time you get your hands on some oysters. The pan will be trashed though so there will be no chance of sneaking that back into the kitchen unnoticed. Just christen it the grilled oyster pan. As we stood around, someone commented that we looked like a bunch of rednecks. There were about 20 cars in the front yard (the majority which were trucks), University of Alabama flags on the cars (ready for the Iron Bowl game the following day), and we were drinking Cheap Red Wine out of plastic cups. You can say what you want about rednecks, but they always look like they're having a good time. And that's exactly what we were having. I hope the Thanksgiving Tailgate becomes an annual tradition.